My car looked absolutely stunning in the glaring sun. The attention it drew was quite overwhelming at times. People stopping to take photos of it, wanting to sit in it, wanting to take photos of them standing near it. Flattering comments on the bodywork and interior with people asking if it is a brand new car. I’m coming up to my first year of ownership, and I suppose I have got a little numb now to how radical a Cerbera still looks today. I lost count of the people that stopped by the car, leant in it, took one look at the dashboard and then called over their family/friends to marvel at the outrageous futuristic curves. It was great engaging with these people too. I was more than happy for kids (and the “big” ones) to climb in and soak up the environment. 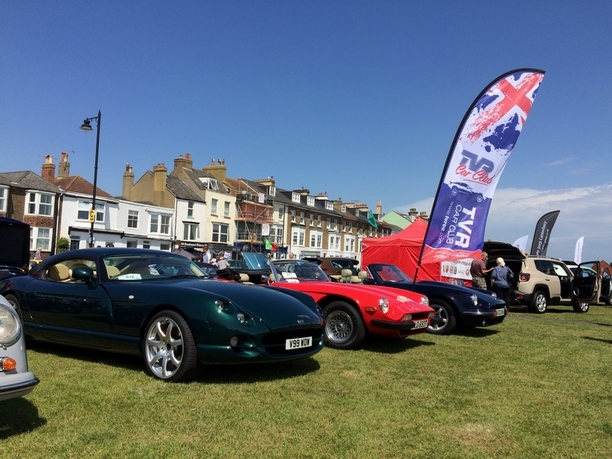 In total we had 6 TVRs from the club turn up, so TVR had good representation. I’m definitely doing more of these.